Urgent message: The increasingly visibility of “whistleblower cases,” in which employees share in any fines from reporting their employer’s malfeasance to federal and state authorities, calls for urgent care center owners to understand the False Claims Act and the whistleblower lawsuit process. As you can see, urgent care centers have run afoul of the False Claims Act and whistleblower lawsuits for many years. And whistleblower activity in healthcare continues to gain momentum. In the first half of 2018 alone, the Department of Justice announced roughly $600 million in FCA settlements. In light of this, it’s critical for urgent care center owners to understand the False Claims Act and the whistleblower lawsuit process. Urgent care center owners and operators should be aware that one of the most litigated issues in whistleblower law is the precise definition of protected whistleblower activity.13,17-19 Note that some states have very narrow definitions of what constitutes whistleblower activity, and others have definitions that are much broader.20 Consult with your legal counsel for the specific parameters in your state. One way that owners can reduce the risk of a whistleblower lawsuit is be certain that their urgent care center compliance programs are up-to-date and comprehensive. These programs should be disseminated in writing to all employees. FindLaw.com. Whistleblower retaliation could land you in trouble. Available at: https://smallbusiness.findlaw.com/employment-law-and-human-resources/whistleblower-retaliation-could-land-you-in-trouble.html. Accessed March 14, 2019. U.S. Department of Justice. Press release. Arizona-based NextCare Inc. to Pay US $10 Million to Resolve False Claims Act Allegations. Available at: https://www.justice.gov/opa/pr/arizona-based-nextcare-inc-pay-us-10-million-resolve-false-claims-act-allegations. Accessed March 14, 2019. Stern R. NextCare, Arizona-based urgent care center company, to pay $10 million to feds for filing false claims. The Phoenix New Times. July 2, 2012. Commins J. CityMD pays $6.6M in false claims settlement. HealthLeaders. Available at: https://www.healthleadersmedia.com/strategy/citymd-pays-66m-false-claims-settlement. Commins J. CityMD pays $883K to settle NY false claims allegations. HealthLeaders. Available at: https://www.healthleadersmedia.com/strategy/citymd-pays-883k-settle-ny-false-claims-allegations. Accessed March 14, 2019. Total Health Care. False Claims Act. Available at: https://thcmi.com/false-claims-act/. Accessed March 14, 2019. National Whistleblower Center. False claims act/qui tam FAQ. Available at: https://www.whistleblowers.org/resources/faq-page/false-claims-actqui-tam-faq. Accessed March 14, 2019. The Opportunity Alliance. False claims act: preventing fraud, waste and abuse. Available at: https://www.opportunityalliance.org/about-us/false-claims-act-preventing-fraud-waste-and-abuse/. Accessed March 14, 2019. Justia. Qui tam/whistleblower. Available at: https://www.justia.com/employment/retaliation/qui-tam-whistleblower/. Accessed March 14, 2019. Carlson v. DynCorp Int’l LLC, 657 F. App’x 168, 170 (4th Cir. 2016). BusinessWire. N.C. whistleblower lawsuit prompts NextCare to settle false claims act case. 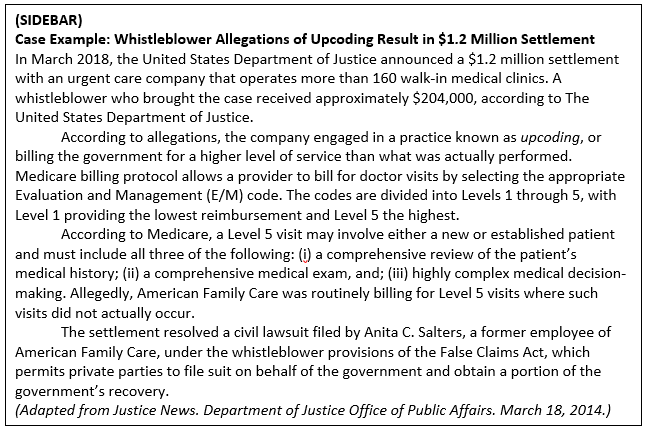 Available at: https://www.businesswire.com/news/home/20120703005670/en/n.c.-whistleblower-lawsuit-prompts-nextcare-settle-false/rk=2/rs=fz9j3_ntnifay2v7zf8uj5s4ic8-. Accessed March 14, 2019. Green D. Keeping track of false claims act’s qui tam cases. Reports Committee for Freedom of the Press. The News Media & the Law. Available at: https://www.rcfp.org/browse-media-law-resources/news-media-law/news-media-and-law-winter-2011/keeping-track-false-claims-. Accessed March 14, 2019. National Whistleblower Center. Know your rights FAQ. Available at: https://www.whistleblowers.org/resources/faq-page/know-your-rights-faq. Accessed March 14, 2019. FindLaw. Whistleblower protections. Available at: https://employment.findlaw.com/whistleblowers/whistleblower-protections.html. Accessed March 14, 2019. WebMD. PPACA. Available at: https://www.webmd.com/health-insurance/terms/ppaca. Accessed March 14, 2019. MacLean v. Dep’t of Homeland Sec., No. 2018-1068, 2018 U.S. App. LEXIS 29942, at *3 (Fed. Cir. Oct. 24, 2018). Bettencourt v. Town of Mendon, No. 16-40065-TSH, 2018 U.S. Dist. LEXIS 164931, at *20 (D. Mass. Sep. 26, 2018). O’Neill v. St. Johns River Water Mgmt. Dist., No. 3:17-cv-79-J-32JBT, 2018 U.S. Dist. LEXIS 162504, at *11 (M.D. Fla. Sep. 24, 2018). National Conference of State Legislatures. State whistleblower laws. Available at (November 11, 2010). Retrieved at http://www.ncsl.org/research/labor-and-employment/2011-whistleblower-legislation.aspx. Accessed March 14, 2019. Protecting your urgent care center against whistle-blowers. J Urgent Care Med. Available at: https://www.jucm.com/protecting-urgent-care-center-whistle-blowers/. Accessed March 14, 2019.